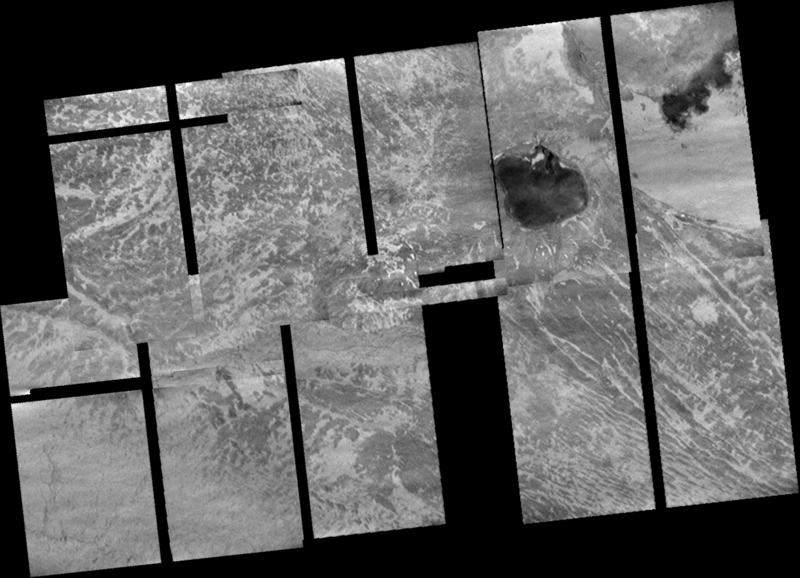 I finished up three more mosaics this evening from 1999's I24 flyby: 24ISPROMTH01, 24ISTOHIL_01, and 24ISDORIAN01. PROMTH01 covers the lava flow at Prometheus, while TOHIL_01 and DORIAN01 cover the mountains Tohil Mons and Dorian Montes, respectively. A quick note on these images: these are the full-size mosaics. The original images were taken in 2x2 summation mode, which became corrupted before the I24 flyby. So the original raw images were 400x400 pixels in size (as opposed to 800x800 pixels for the normal mode images). As part of the unscrambling process, these images were doubled in size, to 800x800. The final unscrambled images submitted to the PDS were in that doubled size. During the course of my processing of these mosaics, I resampled each image back down to their original 400x400 size, whereas most of the released mosaics from the Galileo project left the images in that doubled form. I think by resizing the images back down to the size they were taken in, the quality of the final product is improved. So for example, you can clearly see the difference in the Pillan mosaic mentioned in the previous post between the smeared images (taken with 21-ms exposure times) and the crisper images (taken with 12-ms exposure times). I don't think this difference is as apparent in the expanded images originally released. Okay, now on to the mosaics I've posted tonight. The first is 24ISPROMTH01. This mosaic covers the southern part of the Prometheus flow field and the surrounding bright terrain. The flow as crenulated margins as lava flowed around hillocks that cover the surrounding terrain before they cover them. The flow field itself is covered in numerous darker patches that represent new lava flows that hadn't yet been covered by brighter volatiles. It is rather interesting to compare the dark patches to those that show up in four months later. Many of the darker patches seen in I24 had faded while new dark flows showed up. 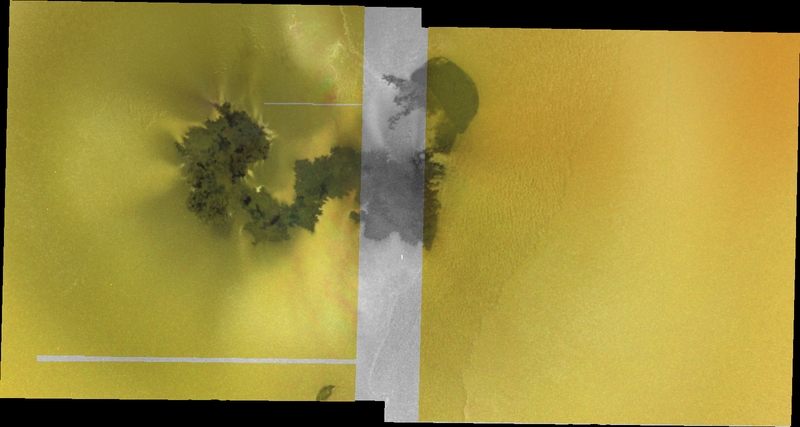 These outbreaks are thought to be created when tubes channel lava from the main vent along a fissure at the eastern end of the flow field (seen between the last and second-to-last frame in 24ISPROMTH01) westward where the lava then emerge as sheet flows. Similar behavior was recently seen at the flows coming from Kiluaea (just imagine that channel is covered). The next mosaic is 24ISTOHIL_01. 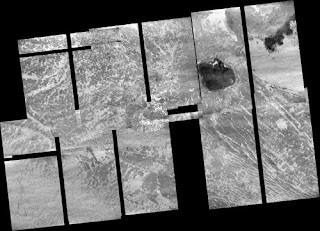 This mosaic covers Tohil Mons, a 5.4 km tall mountain on Io's anti-Jovian hemisphere, and two volcanoes, Radagast Patera and Tohil Patera. Both volcanoes are in the upper right frame. Radagast is the dark, mitten-shaped depression; Tohil Patera pretty much covers the whole right side of the upper right frame. Yes, trust me, there is a mountain there. 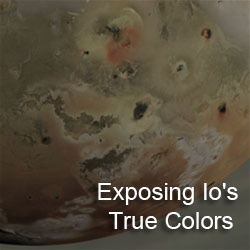 Images acquired during the I32 flyby show the area in low-sun conditions if you don't believe me. If you looks closely, you will note a small surface change within Radagast Patera, where a small, fan-shaped lava flow formed between I24 and I32. Also, comparisons between the two observations can give you an idea of what albedo patterns seen in I24 correspond to which topographic feature in I32. Finally, there is 24ISDORIAN01. 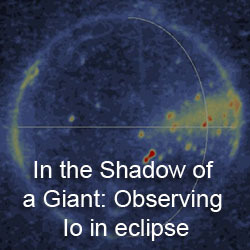 Like the Tohil observation, this shows a tall mountain (Dorian Montes) at high-sun conditions, making the mountain nearly invisible. You can still make out some topographic features that are marked by albedo markings as well. 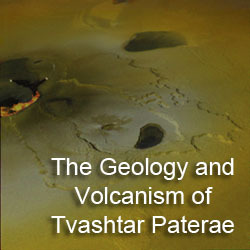 At least two volcanoes are visible in this mosaic: a pair of lava flows associated with Marduk Fluctus in the first frame and Haokah Patera in the third. Still got plenty more to go. Stay tuned.